GOT ZINC? Your classic car or hot rod engine wishes you did. 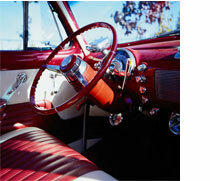 Protect your Investment - protect your classic car engine! Why is Cam-shield™ brand anti-wear additive with premium ZDDP the BEST in the industry? Cam-shield™ is designed to be UN-BEATABLE! BEST cost per treatment dose! Cam-Shield™ brand anti-wear additive is a premium concentrated ZDDP product that is designed to protect classic car engines, particularly camshafts and valve trains in flat tappet cam engines. Anti-wear protection for hot and cold engine operation is provided by Cam-Shield's™ proprietary blend of primary and secondary ZDDP. Cam-Shield™ brand anti-wear additive is perfect for use in classic cars, historic cars, muscle cars, hot rods, and performance vehicles that require high levels of ZDDP anti-wear protection. Cam-shield's™ unique bottle allows the user to treat their exact oil volume at oil change time or for top-off between oil changes. Cam-shield™ is the most concentrated ZDDP anti-wear engine oil treatment available on the market, thus allowing the user the option to treat their favorite engine oil for either break-in of a new cam or for normal engine operation or for racing; without diluting the performance integrity of their engine oil. For cam break-in and racing, ½ ounce of Cam-shield™ is added to your favorite conventional or synthetic engine oil. For normal engine operation, only ¼ ounce of Cam-shield™ is need per quart of engine oil. Cam-shield™ is available in two sizes. The 4 ounce Consumer size treats from 8 to 16 quarts of your favorite engine oil (8 quarts of oil at break-in concentration, 16 quarts of oil at normal engine operation concentration) and retails for $13.95. The 8 ounce Professional size of Cam-shield™ treats from 16 to 32 quarts of your favorite engine oil (16 quarts at break-in concentration, 32 for normal operation) and retails for $21.95. Cam-shield™ was designed by a senior race oil and field test engineer from a major engine oil company using the same proven anti-wear technology in his top professional level race oils and street oils. Cam-shield™ contains a proprietary mixture of primary and secondary ZDDP for full temperature range (cold start to hot operation) anti-wear protection of your classic car's flat tappet cam and lifters.